Although most email services provide some level of proprietary spam detection, third-party spam filters for incoming mail increase the level of spam email detection considerably. Organizations that fail to implement a third party incoming mail spam filter continue to have spam delivered to their employees´ inboxes. Research has shown that an organization with five hundred employees – each receiving just six spam emails a day – will lose more than 130 days per year in productivity. A potentially bigger cost of spam emails comes from malware. A 2015 report produced by the Ponemon Institute – “The Cost of Phishing & Value of Employee Training” – calculated that the average cost to an organization of removing malware and recovering data was $1.8 million. By 2018, the average cost of a data breach had risen to $3.62 million, according to the Ponemon Institute’s 2018 Cost of a Data Breach Study. Unfortunately it only takes one click on a link to a malicious website for a network to become infected by malware or for ransomware to be installed. It is not uncommon for ransom demands to be issued in the region of $50,000 to supply the keys to decrypt files. By comparison, the cost of third-party spam filters for incoming mail is typically less than $10.00 per employee per year. Third-party spam filters for incoming mail have more mechanisms to check for spam than proprietary filters. Usually these will consist of front-end tests that compare incoming emails against blacklists of known spammers, Sender Policy Frameworks, and SMTP Controls. Each incoming email is assigned a Spam Confidence Score based on its content and then either delivered, quarantined or deleted based on the Acceptable Spam Threshold applied for the recipient. Spam Confidence Scores are primarily calculated using a process known Bayesian analysis. Greylisting involves returning every email to the sender´s server and requesting that it is resent. As spammers´ servers are busy sending out more spam emails, they are too busy to resend previous emails, the request is unanswered and the spam email never returned. Having passed intensive spam detection tests, emails are then inspected for the presence of malware. Most organizations will already have antivirus mechanisms in place to protect their networks from trojans harboring adware, spyware and botnets; but some antivirus software fails to address the risks from email-borne threats such as phishing attacks and malicious URLs. Phishing attacks and malicious URLs within emails are two of the biggest threats to online security in the present environment. The success of the attacks relies on the weakest link in your security chain – your employees. When employees inadvertently divulge usernames and passwords to databases in which confidential data is stored, or visit websites that harbor malware, it is not only your online security that is at risk, but also your professional reputation. The antivirus mechanisms within spam filters for incoming mail offer phishing protection and malicious URL blocking – not only within the content of an email, but also within any attachments. These features are not present in proprietary email filters, but they are essential tools to mitigate the risk that your network will be infected with malware from email-borne threats. One further benefit of having antivirus mechanisms built into spam filters for incoming mail is that they scan outgoing mail for malware as well. It is unlikely that anybody within your organization would deliberately send out a malware-infected email. However, an employee emailing an infected file prepared on a home computer could cause your organization´s IP address to appear on a global blacklist – an event that would result in your organization´s email being blocked by your clients´ spam filters for incoming mail. SpamTitan´s spam filters for incoming mail have multilayered detection mechanisms to identify spam emails and those that contain online security threats. Our robust solutions for filtering mail use Bayesian Analysis and Greylisting to return a 99.97% detection rate – according to the leading independent testing and certification body VB Bulletin – and a low false positive rate of just 0.03%. Dual real-time antivirus protection is provided by top-rated Bitdefender and ClamAV. The antivirus engines scan both incoming and outgoing emails and have a 100% malware detection rate. Our filters also ensure email continuity in the event of downtime or a server outage, and are managed via an easy-to-use browser-based console that includes customizable configuration settings, monitoring features, and report options. SpamTitan Gateway is a powerful virtual appliance that is installed between your organization´s firewall and its mail server. It is an infinitely scalable incoming mail spam filter that has one of the best anti-spam catch rates from a host of market leaders. SpamTitan Cloud is a versatile incoming mail spam filter that has three cloud-based hosting options for larger organizations and Managed Service Providers (MSPs). Like SpamTitan Gateway, SpamTitan Cloud supports multiple domains and an unlimited number of users. For MSPs, SpamTitan´s spam filters for incoming mail provide unmatched email security for your customers and make anti-spam solutions profitable – for you and for your customers. Both SpamTitan Gateway and SpamTitan Cloud protect your network from rogue or hacked customers, and both are available in white label format for rebranding, with an extensive API set available for integration with third-party management products. We believe that the best way to evaluate an incoming mail spam filter is to trial it in your own environment. Consequently, we invite you to trial SpamTitan free for thirty days. Our offer consists of a fully-enabled incoming mail spam filter, technical and customer support, and no obligation on you to purchase a license once your thirty-day trial period has ended. To take advantage of this invitation, simply call our team of Sales Technicians today. 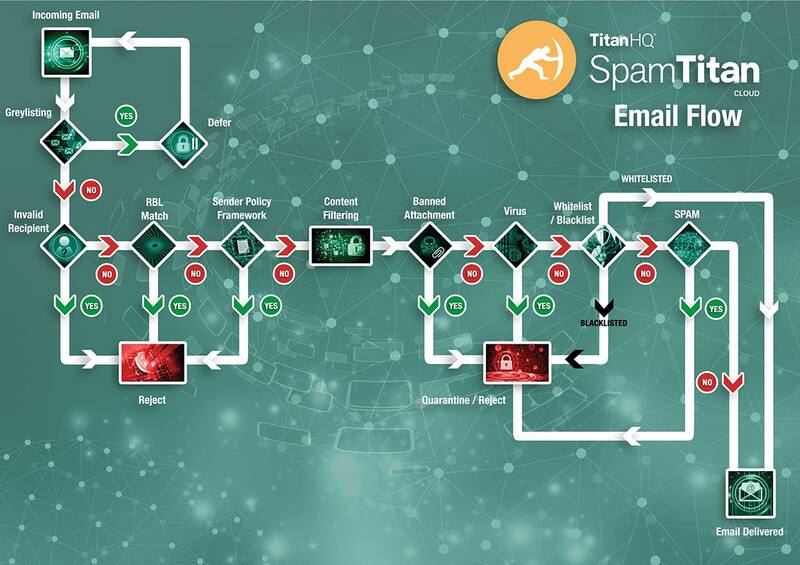 One of our team will be happy to answer any questions you may have about spam filters for incoming mail and guide you through the process of installing and configuring your chosen SpamTitan solution. Within minutes you will be filtering your inbound and outbound emails to help reduce productivity loss and mitigate the risk of malware from email-borne threats.